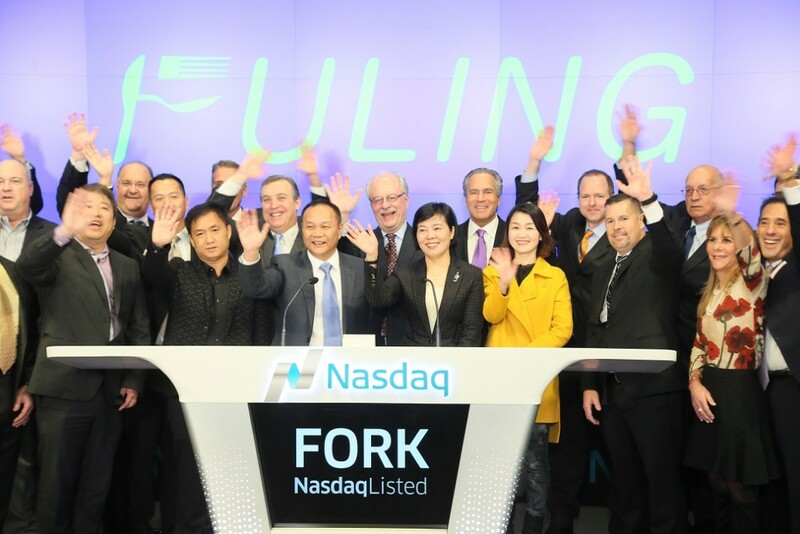 Fuling Plastics took part in the NASDAQ Stock Exchange opening bell ceremony in New York City on November 24, 2015. LVEDC representatives were in attendance. The first Chinese-based company to establish its American operations in the Lehigh Valley is now also the newest member of the NASDAQ Stock Exchange. Fuling Plastics USA, China’s largest manufacturer of plastic tableware and kitchenware, participated in the stock exchange opening bell ceremony in New York City this morning, in recognition of the company recently completing its initial public offering (IPO). Representatives from the Lehigh Valley Economic Development Corporation (LVEDC) were invited to attend the ceremony, including President and CEO Don Cunningham, and Director of Business Development Jarrett Witt. Fuling is establishing a $21.3 million facility in Upper Macungie Township, a project LVEDC helped recruit for nearly a year. Fuling completed an IPO last month and raised $20 million through the issuance of 4 million ordinary shares at a price of $5 per share. The company is now trading on the NASDAQ Capital Market under the symbol “FORK”. 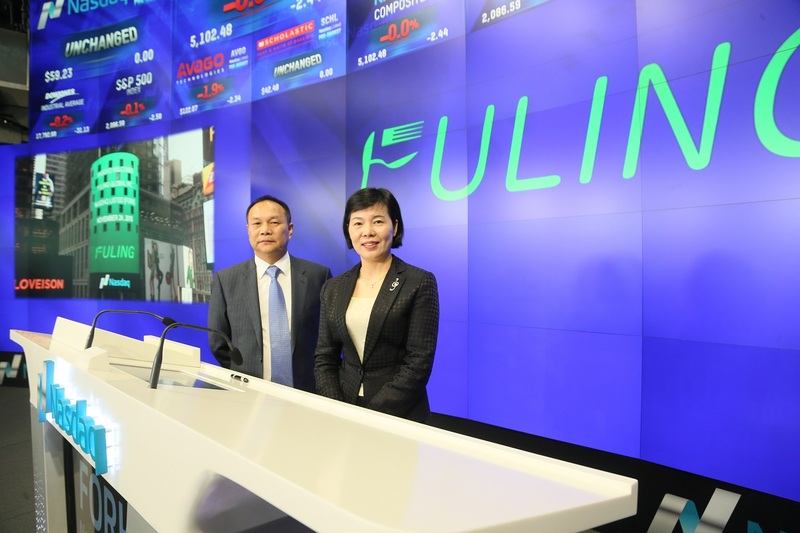 Fuling Plastics CEO Xin Fu Hu and President Guilan Jiang at the NASDAQ Opening Bell Ceremony. The company’s 88,000 square-foot facility in Upper Macungie Township marks the first time a Chinese manufacturing company has established a facility in the state of Pennsylvania. The $21.3 million project is expected to create 75 jobs. Fuling supplies plastic utensils to fast food giants Burger King, Wendy’s, Subway, Kentucky Fried Chicken, and others, as well as national supermarket chains Walmart, BJ’s Wholesale, and Target. Before settling on the Lehigh Valley, Fuling had considered sites in North Carolina, South Carolina, Virginia, Maryland, and New Jersey, as well as five locations in Pennsylvania. LVEDC worked on the recruitment of Fuling along with the Pennsylvania Department of Community and Economic Development and the Governor’s Action Team. Fuling officials said they ultimately chose the Lehigh Valley because of its central location, convenient transportation, strong support network, public security, and the cooperation of local officials in making the project happen. The Lehigh Valley’s gross domestic product has risen to a record-high $35.4 billion as of 2014, and manufacturing makes up the third-largest portion of the GDP at $4.95 billion. The regional GDP for manufacturing grew 4.1 percent over the previous year, and ranks 64th out of 351 major U.S. metros tracking that subcategory. The Lehigh Valley has become an increasingly strong market for international companies. About one-third of LVEDC’s prospects are from outside the country, and many of the region’s big success stories from the last year are from international companies. This includes Fuling, and the French company Safran establishing a repair facility in Lower Nazareth Township. This summer, representatives from LVEDC embarked on a ten-day tour of Western Europe to attract foreign direct investment, with stops in Germany, France and England. This tour included daily direct marketing to prospective companies, as well as visits with international prospects with which LVEDC had already been previously engaged.